Drugs, alcohol and a lack of discipline are perceived to be the main causes of Northern Ireland’s crimes according to the recent perceptions of crime survey. Designed to complement recorded crime figures and offer an impression of the extent of concern about crime, the Perceptions of Crime survey published by the Department of Justice aims to reflect public attitudes to crime and anti-social behaviour. 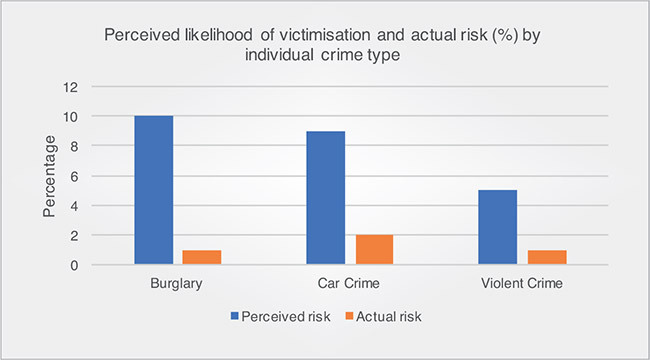 Surveying almost 2,000 adults living in private households, the recently published 2015/16 figures show that 10 per cent of people believe that they will be a victim of burglary in the next year, 9 per cent think they will be victim to vehicle related theft and 5 per cent perceive a risk of violent crime. In terms of overall crime levels, a total of 60 per cent of respondents perceive that levels have increased in Northern Ireland over the course of the previous two years. 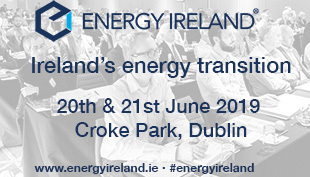 While similar to 2014/15 levels (58 per cent), the figure is significantly lower than the highest recorded figure of 79 per cent presented in 2003/04. The majority of people perceived crime trends to be occurring on a more regional, rather than local level, with only 29 per cent believing local crime rates had increased over two years. Despite registering lower levels of crime, when compared to a similar survey carried out in England and Wales, Northern Ireland respondents displayed higher levels of worry about potential crime than their counterparts. 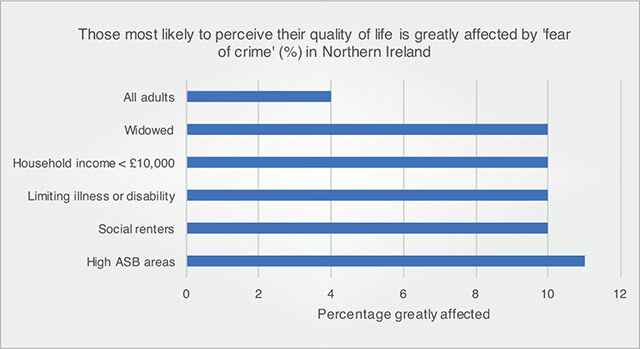 When looking at specific crime categories, respondents in Northern Ireland recorded greater worry in terms of burglary, violent crime and car crime. In terms of personal safety, the survey shows that women perceive themselves to be more at risk than men, most notably in terms of violent crime and when walking alone after dark. Respondents living in the most deprived areas of Northern Ireland (23 per cent), single adults with children (21 per cent), social housing (21 per cent) and those with a household income of less than £10,000 showed the greatest levels of worry about crime and this has been linked to perceived levels of anti-social behaviour (ASB) within their communities. Comparing areas of perceived high ASB with those areas with a low perception highlights significant differences in the levels of worry within these areas. Despite high levels of worry around potential crime, just 4 per cent of respondents felt that fear of crime greatly affected their quality of life. However, 23 per cent said it had a moderate effect, while the majority (73 per cent) rated the fear of crime impact as “minimal”. As with personal safety, women were more likely than males to perceive a greater impact on their quality of life due to a fear of crime. As expected, community environment played a huge role in defining respondents worries of crime. Compared with the least deprived 20 per cent to claim a fear of crime, respondents living in the 20 per cent most deprived areas were over twice as likely to believe that fear of crime has a detrimental impact on their quality of life. Those on lower income brackets also displayed a greater fear of crime when compared to the more affluent. Of the respondents earning less than £10,000 annually, 10 per cent felt it had a great effect compared to 1 per cent of those earning £40,000 to £49,999 and 2 per cent from households earning £50,000 or more. There was a similar disparity when comparing areas of perceived high and low ASB. Participants living in high ASB areas (11 per cent) were more than twice as likely to say fear of crime has a great effect on their quality of life than those from areas of low ASB (4 per cent). Those reporting a moderate impact differed 46 per cent to 21 per cent, comparatively. Those reporting that fear of crime had a minimal effect on their quality of life differed substantially based on ASB areas. A total of 75 per cent for areas of low ASB compared to 43 per cent for high ASB areas.